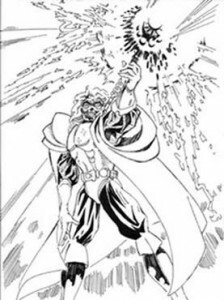 Theophrastus Prospero and his staff. So, my copy of Ghost Story finally came, and I read the whole thing in three days. Pretty good. Rather unexpected. Just have to say: I didn’t see that coming! But, this post is not about Ghost Story. This is yet another post about trying to figure out how to describe the Corruption Campaign novel. But I digress. Not like that. Mystery book? It’s ‘not like that.” Dark story? ‘not like that’ Frivolous Chick Lit? Not like that. It wasn’t this way with the Prospero book. I knew what it was like right from near the begining. My very first reader described it as: Neil Gaiman meets C.S.Lewis or, for an American equivolent, Roger Zelazny meets Lloyd Alexander. And that is exactly what it was like. But this novel? It’s not like that. So…what is it like? Well…it’s like The Corruption Campaign, the best roleplaying game in the world. People don’t keep playing the same character in the same game for 25 years if it isn’t one cool game! And this book, this version (try number 13)…well, it feels a lot like the game its based on. So…what is the game like? Ah, that’s the rub, isn’t it? I’ve never been able to describe it. Bright. Filled with wonder and awe. A game where gods can come onstage and still feel like gods…twenty five years later. Colorful. Really colorful. Like four color comics. Imagine the Justice League if the main character was Nausicaa of the Valley of the Winds. In fact, that may be the best description I’ve ever given. I originally fell in love with Nausicaa, back in the 80s, because she reminded me of the character who is now the heroine of my book. Imagine Star Wars Stormtroopers in Oz. Imagine Heinlein characters meeting guys from Tolkien and Narnia…and everybody being able to hold their own. Imagine Amber if the Jedi lived in Arden.